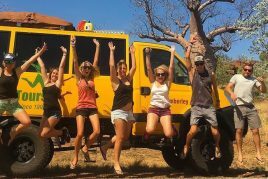 1.The sun rises early in the Kimberley so there’s no point in sleeping in, we’ll pick you up from your Darwin accommodation at 6am and head for the wilderness. 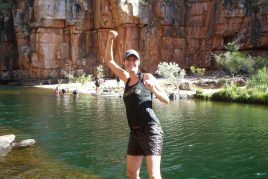 Our first stop on the Darwin to Broome tour is about 2 hours South of Darwin, Edith Falls in Katherine Gorge National Park, a short 3 km walk to the upper pools brings us to the first of many beautiful waterfalls which we will see over the next 9 days. After lunch we push west towards the Western Australia / Northern Territory state border and our first bush camp. 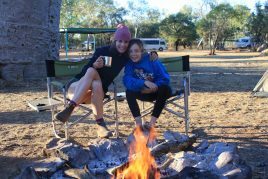 Bush camping is a great experience whether you are an experienced outback drover or first time city slicker, we have been in the Kimberley for such a long time that we have established relationships with the local land holders, both Cattle Stations and Custodians of Aboriginal Land, and we have permission to camp in wild places that are off limits to the public. 2.With no roof over our heads the breaking dawn is our new alarm clock and we rise early. The mobile phones get packed up with the camping gear as they become useless and we head off nice and early for our days activities. Start the day off by meeting Mr. Bill Harney, an aboriginal elder. 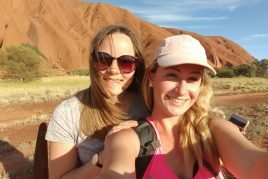 We will go for a 4wd drive adventure to the back of his property and Bill will show us some rock art, tell stories and sing songs on a personal cultural tour. Tonight we head to Lake Argyle for what is regularly voted as the highlight of the tour. Lake Argyle is a huge freshwater lake teaming with wildlife, from wallabies in the rocky shores, to freshwater crocodiles to birdlife. We board a boat where a local guide shows us the lake, there is time to swim before we watch sunset from the water and then camp on one of the remote islands. This is a great experience, knowing you are the only people on a single island in the middle of one of the most remote lakes in the world is unforgettable. 3.The sunrise from our island camp is unforgettable. From Kununurra we head to one of the highlights of this Kimberley trip, Purnululu National Park, more commonly known as the Bungle Bungles. 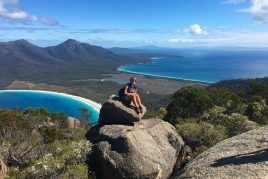 Our time in this region is spent hiking and exploring the Gorges and amazing landscapes the area contains. The long and dusty track into the Bungles is spectacular; it winds its way through valleys, over ranges and through creeks before arriving at what must be one of the world’s most unique landscapes. The day ends with a spectacular sunset from a vantage point at camp. 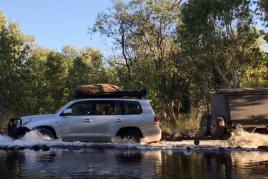 5.Today we get onto a dirt track, the famous Gibb River Road, a 700km long outback road which runs between Derby and Kununurra, it’s not the easiest route, the track is often rough, there are a number or deep water crossings and a 4WD vehicle is essential. However it’s an amazing travel route as along the length of the Gibb River Road are vast tracts of wilderness and numerous rivers, gorges and waterfalls to explore. From here it’s back on the “The Gibb” where we continue on our westerly trek. Arriving at the Pentecost River we are presented with an incredible landscape of a wide river surrounded by rugged Cockburn Ranges, a classic Kimberley scene. Another bush camp and classic Kimberley Sunset awaits at the foot of the Rugged Cockburn Ranges. From camp our first task is to drive the 4WD though the Pentecost River, driving a vehicle across a 60 metre wide outback river which is occupied by Salt Water Crocodiles is not something you do every day, but it’s only way through so across we go. 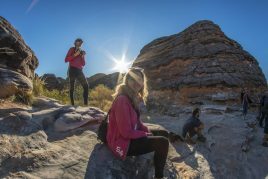 Today we push west, there is a variety great spots to stop and check out, including secluded waterholes and Ellenbrae Cattle Station before arriving at Manning Gorge. Camp tonight is either at Manning Gorge, where toilets and showers are available, or back into the bush depending on the preference of your guide. 7.Another day of adventure awaits. From camp our daily hike, white sandy beaches with a Pandanus tree lined waterway opening into a wide clear waterhole greet us only minutes after starting the walk. We must swim across the river before following a trail leading to the top of gorge. The gorge has a waterfall plus a deep wide swimming hole surrounded by granite cliffs & rock outcrops. It is a spectacular setting with hidden examples of Bradshaw Aboriginal Rock Art. 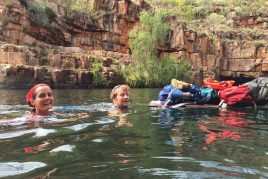 The return route from manning Gorge is a little less conventional as we swim and rock hop along the creek before reaching the main waterhole where it started. Depending on the time available, Galvans Gorge is also visited. On departing Manning we locate our bush camp and set up for another night under the stars. 8.The main stop for the day is Bell Gorge, another day, another amazing waterfall to explore! Such is life in the Kimberley. After a 15-minute walk we come to a beautiful Creek, which flows through the centre of this impressive gorge and cascades over numerous falls. 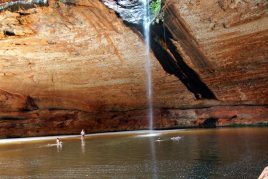 A deep swimming hole at the base of the main waterfall, surrounded by shady ledges and high cliffs, is an ideal lunch spot. If time permits we also drop into Adcock Gorge today. Our last wilderness bush camp for the tour is another cracker offering a classic Kimberley sunset and camping among the boab trees. 9.By now we are experts to getting up early and on our way, our final watering spot for the tour is Tunnel Creek. Tunnel Creek is an amazing natural phenomenon and holds great significance to the local Aboriginal people, and getting there early normally guarantees we have the place for ourselves. It is a 750 metre long stretch of creek, which runs underground through one of the oldest cave systems in Western Australia. Aboriginal rock paintings are present in the cave and it was a hideout of the Aboriginal warrior, Jandamarra in 1897. Next we head to Windjana Gorge, a huge gorge cut into the ranges over millennium to reveal beautiful scenery of high vertical cliffs, sandy beaches and meandering creek. 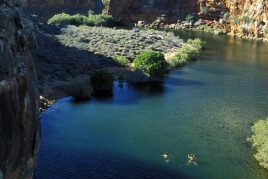 We head off on a hike at Windjana of 2- 4km and always see freshwater crocodiles swimming in the clear waterholes. From Windjana Gorge we check out the Boab Prison Tree near Derby and then make our way into Broome. 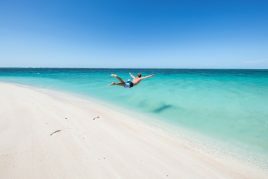 We normally arrive into Broome at around 6pm and head for Cable beach to soak up the last amazing sunset of the tour, your guide will then drop you at your accommodation.